Watching old Soviet military parades may not seem like the best use of your time, and to be honest, it probably isn’t. But there’s something weirdly transfixing about them. It’s really easy to get drawn in by the pomp and circumstance, to get hypnotized by the bugles and drums and rhythmic marching. At first, all the parades look the same. The politburo slowly climbs the steps to their Communist version of a skybox on top of Lenin’s tomb, then a general in an open-topped Lada drives around Red Square congratulating the masses of soldiers and sailors on the anniversary of the revolution, then the parade actually starts. But if you watch long enough, you’ll start to see differences. The generals change. Each general has a slightly different inflection when addressing the troops. Some years are nothing but military hardware, whereas other have mass dance numbers and floats with Marx’s face on them. 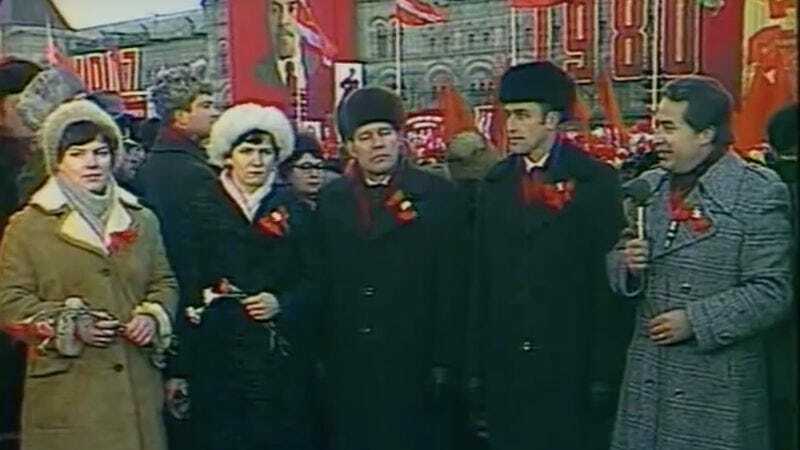 Suddenly, you find yourself Googling “What happened in the Soviet Union in 1986?” to make sense of the changes, and you’ve spent three hours watching parades in Red Square. Enjoy commemorating the revolution, comrades.